Like most people looking to crack into the writing/publishing world, I have a number of unpaid jobs. I list them as internships on my CV to make them sound a little more impressive but really I’m just an unpaid office monkey who prints things out, writes post-it notes and makes figurines out of paper clips. But I’m slowly being assigned proper tasks. For example, I’m now in charge of the Twitter account for the organisation I work for. I won’t give specifics but it is an organisation that works with books and writers and all things literary. They asked me to build up their Twitter presence and cut down the number of people they followed. When I took over the account they were following 2,352 people. I was told that it would probably look best for the organisation if they were followed by more people than they were following. We had 1,143 followers, so 1,209 people had to go. At the time it seemed cruel scrolling through and culling innocent tweeters. But I quickly realised that there was no room for empathy. I couldn’t follow someone just because they were following the organisation. If I was precious about followers then I would end up with a news feed full of irrelevant, boring fluff. 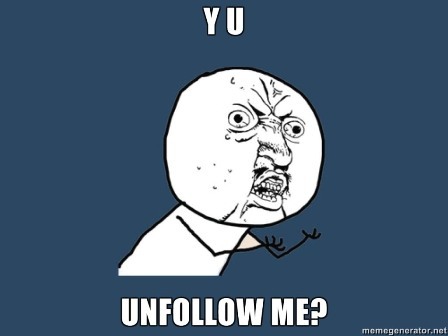 I had to toughen up and click ‘Unfollow’. Here is a handy (if somewhat ranty and crazy) list I developed during my unfollowing spree which may help others. Over-share. Over-sharing is one of the top social media sins. Thankfully the word limit imposed by Twitter cuts short the long confessionals you sometimes see on Facebook. But there are still offenders out there. Juicy, confessional tweets can be hilarious, but this type of over-sharing can get gross and disturbing very quickly. If your poo is purple, consult a medical professional. Don’t tweet about it. Then there are the over-sharing Twitter bios. For example, ‘My name is Brett and I’m a steam punk devotee who wants to run a cupcake parlour. I live with my girlfriend of eight and a half years and we want five children.’ Brett, you sound sweet, but this is unnecessary. Give incentives to reach more followers. ‘Wow! Almost 500 followers. Help me get there folks. Reward for 500th follower ;)’ This is not preschool. You cannot bribe people to be your friend. Re-tweet compliments. Blogger Tracie Morrissey once said that re-tweeting compliments is like smelling your own farts. Enough said. Tweet about food ALL THE TIME. Look, I’m really happy that you’re having kale for breakfast. That must be great for you. I hear kale is the latest superfood. I’m pleased to see you’re having kale for lunch as well. Oh and kale for dinner! You must really like kale. Wait, now you’re eating kale for dessert with kale sprinkles and kale cream washed down with a kale pale ale? Well, that’s just swell BUT I DON’T WANT TO KNOW. Use Twitter for self-promotion. We are all guilty of this at some point but just like your grandma always says: ‘everything in moderation’. Overuse hashtags. For those who aren’t fluent in Twitter-speak, hashtags allow you to create a conversation or thread. They sort your tweets with others that have put hashtags on the same words as you. This can actually be a nice way to create an online discussion. For example, I applaud Q and A’s use of hashtags. They prove that Twitter can be used to spark intelligent debate. But again, moderation please. Don’t put a hashtag in front of every single word in your tweet. Not only is it difficult to read, but it is also overbearing, especially if you combine it with shameless self-promotion: ‘At #Dymocks signing my #bestselling #trilogy #SeeRed, #BloodLust, and #BestServedCold. Get in quick! #hotproperty’. Love using ellipses. Using ellipses on Twitter is a waste of characters and it’s just as annoying as vaguebooking is on Facebook. ‘Well that was an awful night…’ I unfollow people who use ellipses to hint at something and wait for people to take the bait. I don’t have time to play games. They have a horse in their profile picture – and not in an ironic way. If you’re an equestrian magazine or a jockey, then a horse in your profile picture is acceptable. I’ll let you off this time but you should count yourself lucky. Chuck a horse in just because you really freaking love horses and my eye will twitch. I don’t want to know about how beautiful horses are. Frankly, the fetishisation of horses confuses and scares me. This irrational hatred can probably be traced back to a traumatic childhood incident with a pony. They use the phrase ‘bookworm’, ‘aspiring author’ or ‘cat lover’. You have to understand that by this stage of my culling spree I had become trigger happy. I was unfollowing people with the manic enthusiasm of an acne-ridden teenager popping zits. My cursor would slide over the ‘Following’ icon and it would glow read: ‘Unfollow’. I would tease it. I would hover over the icon and then scroll down and then scroll up and hover over it again, watching as it flickered from ‘Following’ to ‘Unfollow’. Finally, with a triumphant Pop! the icon would deflate into ‘Follow’. It was ridiculously satisfying and cleansing in a strange way. My beef with the phrases ‘bookworm’, ‘aspiring author’ and ‘cat lover’ are that they are clichéd. Keep in mind that the Twitter account I was in charge of was about books and writing. If I had a dollar for every person who described themselves as a bookworm/aspiring author/cat lover I would have bought Twitter by now. You don’t like the person in real life. It sounds obvious but don’t follow someone just because they follow you, especially if you don’t actually like them. Don’t be afraid to click ‘Unfollow’. It will empower you. It will set you free. This entry was posted in Opinion and tagged in defence of, social media. Bookmark the permalink.